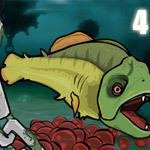 Description: That's right, the agressive little fish is back to revive the bloody horror yet again! The fourth game in the action series gives you even more flesh off the bone. A new plot with a new map, more dangerous obstacles to avoid, treasures to find, but most importantly; much more humans to devour! Have Fun!